A lot of software companies struggle with estimating their budget, especially the ACV. 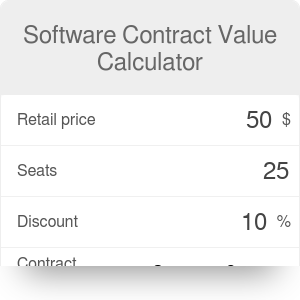 That's where out software contract value calculator steps in, helping you calculate the annual and total contract value in no time at all. With just a few clicks, you will know how much money you will make on every contract! Retail price: the regular monthly price of one subscription for one user. Seats: number of users who will be granted access to the software. Discount: perhaps you want to give your customers a discount if they buy a package of 10 seats? Enter the percentage discount in this field or switch to the advanced mode for a fixed discount, like $50. Contract duration: for how long will the customer pay the monthly subscription cost - a month, half a year, a few years? Discounted price: this is the monthly price of one subscription for one user after the discount - make sure to take a look at it. Monthly cost: it's calculated as the discounted price multiplied by the number of seats. It is the amount of money you'll receive each month. Annual cost: this is the ACV, or the annual contract value. You will make that much each year of this customer's subscription. Contract value: this is the TCV, or total contract value. It's the total that you will make, considering the contract duration - if the contract exceeds a year, it will be higher than ACV. If you would like to analyze the marketing aspect of your business, try the online marketing conversion calculator. Software Contract Value Calculator can be embedded on your website to enrich the content you wrote and make it easier for your visitors to understand your message.